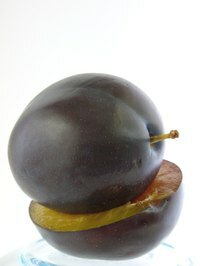 The color plum refers to a color that looks like the color of the plum fruit. Plum is a deep, dull purple. It can look more blue than red or more red than blue. You can make plum in a similar way to making purple. However, which pigments you choose will make your color look more plum than purple. Graying out the purple with green or black will help make it resemble plum more than purple. Set up your palette with multiple reds, such as quinacridone, magenta and alizarin. Set up a few blues such as ultramarine, cobalt and cerulean. Put out a few earth tones like burnt sienna and raw sienna, and even some greens like sap green and permanent green light. Squeeze out some black and white onto the palette. Mix one of the reds with one of the blues, such as magenta and cobalt, quinacridone and cerulean, or alizarin and ultramarine, using a palette knife. Add a little bit of white to get an idea of what the color looks like. Add a touch of green paint if the color looks too much like purple and not enough like plum. Try mixing a red, especially quinacridone or alizarin, with black to make a deep red plum color. Add a little bit of blue if the color appears too red. Mix some white into the color to really see what the color looks like. Mix a blue, like cobalt, with a tiny dab of red, like magenta, and black to make a deep blue plum color. Mix a sienna earth tone with a little bit of red and a little bit of blue to render a brownish-looking plum color. Add more or less white to make a lighter or darker tint of plum. Use black to shade and neutralize the plum color. Adding black will create a grayer plum than adding pure color. Mix multiple blues with a single red, or mix multiple reds with a single blue to create many slightly different shades of plum.